Does anything in nature despair except man? I feel inadequate. I have made an open place, a place for meditation. What if I cannot find myself inside it? For a long time now, every meeting with another human being has been a collision. I feel too much, sense too much, am exhausted by the reverberations after even the simplest conversation. But the deep collision is and has been with my unregenerate, tormenting, and tormented self. I have written every poem, every novel, for the same purpose—to find out what I think, to know where I stand. I am unable to become what I see. I also give the answers. It was a strange relationship, for he knew next to nothing about my life, really; yet below all the talk we recognized each other as the same kind. He enjoyed my anger as much as I enjoyed his. Perhaps that was part of it. Deep down there was understanding, not of the facts of our lives so much as of our essential natures. “There is something demoralizing about watching two people get more and more crazy about each other, especially when you are the only extra person in the room. It’s like watching Paris from an express caboose heading in the opposite direction—every second the city gets smaller and smaller, only you feel it’s really you getting smaller and smaller and lonelier and lonelier, rushing away from all those lights and excitement at about a million miles an hour.” P.
I am losing the ability to hold a conversation with people. My voice drowns. My mind wanders. I am holding on to those written words, clinging to them like they were the last piece of wood of a fragile boat that the sea swallowed before. I am holding on to that last trace of whatever it is that makes me human. …but, what are we looking at? A puppy starving for a glance that fearfully walks away after it gets it; overwhelmed, confused. Connections and detachment fight for a place inside conflicted minds, echoing the struggles of those lonesome beasts of the steppes. It is raining. I sit by the window and start to look at the world I know, where the jasmines and some white lilies briefly live. Nothing compares to the scent of the jasmines, I think. As I repeat that particular thought inside my head, the rest of them start to ramble. Trapped in the inner world as they contemplate what’s outside. They blend with reverie and solitude and begin to restlessly create memories. Brand new memories of things that I have never experienced. A sense of nostalgia towards things that were never real. A feeling of loss at what I have never had. Possibilities are endless and I cannot control anything. Except the presence of those simple jasmines. And how their fragrance make me feel. For I do not want a mere surface of bright colors or unusual forms. I want everything. This room is a place in the world. Here I breathe, I dream, I read, I write. Do I live? I do feel that universal sense of discontent with life that I wish I could shake off at once. Happiness must exist, somewhere. A moment, a day, a year. A book, a place, a song, a person. And then I think—that inevitable activity that haunts us everyday. And then. And then I am not sure if I want to find that happiness and belong to the flock. Even though I believe that I am already a part of one. But mirrors await. Poetry emerges from every nook. Time, unforgiving time. Time is everything. Give me a day and I will give you a year of thoughts. With time, I will accept. I will regret. Fortunately or against my wishes, I will also start to forget. I was never able to forget completely. But things become quiet memories. It all starts to lose its brightness. Its warmth. I thought about someone today. Those faintly aloof eyes. I smiled. A colder memory now. I am an ornery character, often hard to get along with. The things I cannot stand, that make me flare up like a cat making a fat tail, are pretentiousness, smugness, the coarse grain that often shows itself in a turn of phrase. I hate vulgarity, coarseness of soul. I hate small talk with a passionate hatred. …it is a waste of time to see people who have only a social surface to show. I will make every effort to find out the real person, but if I can’t, then I am upset and cross. Time wasted is poison. The thing I want to control the most. So intimate, so special, so familiar. These journals reminded me of a book I absolutely adore. A brushstroke of sweet, melancholic poetry on every page. The deafening sounds of a silent introspection. I have found more words to describe the inexplicable, since my own are never enough. I am accused of disloyalty because I talk about things that many people would keep to themselves…I am not at all discreet about anything that concerns feeling. My business is the analysis of feeling. 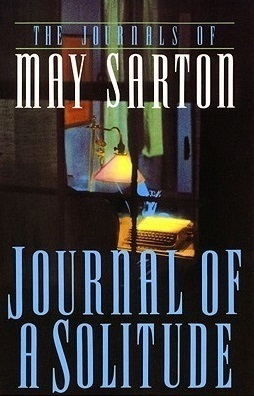 May Sarton merged nature with solitude and, as a result, this beautifully crafted book came into existence. Journals filled with her impressions on the natural world, relationships of all sorts, the creative process and the isolation that it inevitably requires, the ebb and flow of her depression, the moments of peace in between. A walk through the depths of her complex soul has been portrayed with a most exquisite and honest writing. * Photo credit: Book cover via Goodreads. Previously unknown book, i'll pay attention now. Thanks for sharing tje excerpts.